L-Arginine combined with natural wax conditions the hair and leaves it feeling soft. Formulated with Caffeine, Shea Butter & Argan Oil to rehydrate and energise under-nourished and damaged hair. Gives hair ?frizz-free' definition and flexible control without weighing it down. Vegan Friendly & Cruelty Free Certified.Built-in Pre-Shave Performance with Meadowfoam & Tea Tree Oil, Caffeine, Sea Kelp, Copper PCA & 12 Essential Oils. 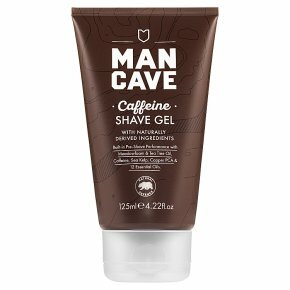 ManCave Caffeine Shave Gel contains Natural Oils that replicate a Pre-Shave treatment, helps to soften facial hair and lubricate skin, whilst reducing razor friction for an extremely close yet comfortable shave This product does not contain; parabens, sulphates (SLS SLES), synthetic dye, petrolatum, mineral oils, ingredients from animal sources and is not tested on animals. Directions Create a lather with a small amount of shaving gel & apply to shaving area in a circular motion. Proceed to shave, rinse with water and then apply ManCave Post Shave Balm.